"I had wanted to work with Archie [Goodwin] for a long time, considering him to be one of the best writers in the business. That first issue was full of so much neat stuff — small stuff, texture — that it was an absolute joy to work on, and everything I had hoped. It only got better from there. I did not actually work “with” Klaus. 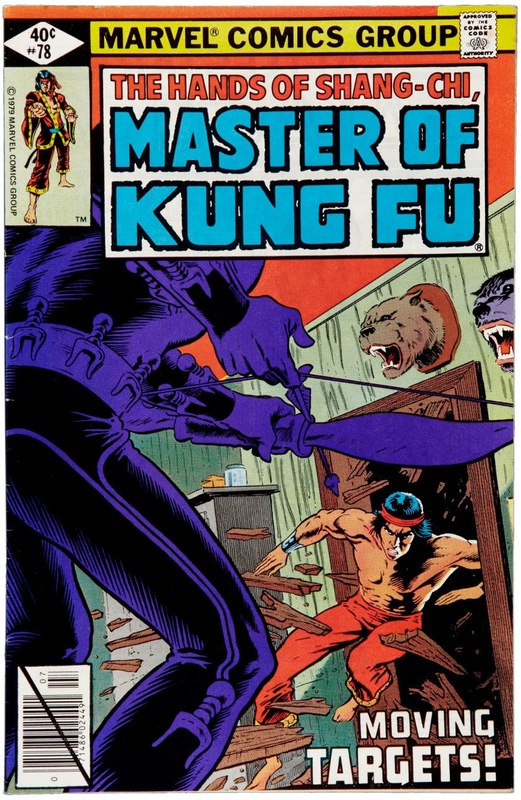 It is a common misapprehension amongst fans that there is some kind of collaborative effort between all parties concerned in the production of a comic, but this is the exception rather than the rule. 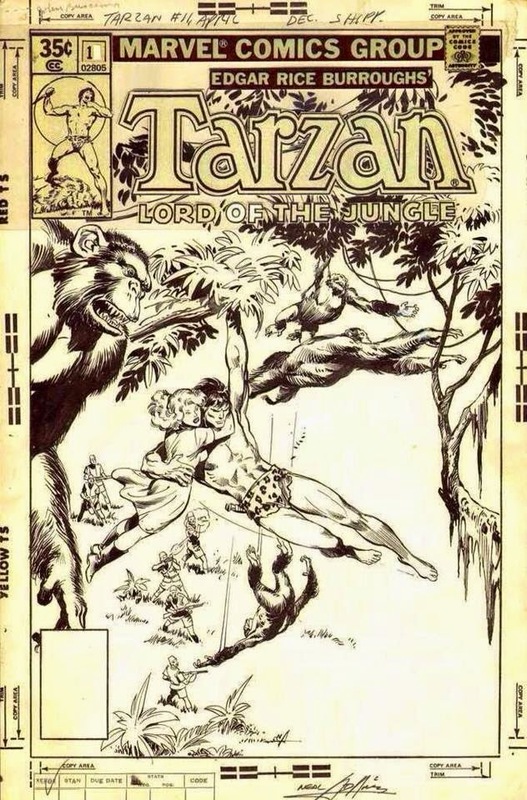 I penciled the first 4 issues thinking Al Williamson was going to ink (as indeed he did, a single panel on pg 2 of the first issue), and Klaus came in as a last second replacement when Al bailed. Had I known from the start that it was to be Klaus I might have had a better idea what the end result would look like, since he and I had worked on Avengers . Archie was a great talent and a true gentleman. I still miss him." 1980 - Uncanny X-Men - "Days of Future Past"
After enjoying Bryan Singer's take on this X-Men classic, I thought I'd have a read over of the original material. Days of Future Past kicks off in the far flung future of the 21st century known as 2013, which might have seen like the future in 1980, but oddly enough, it's now our past. Kate Pryde travels through a post-apocalyptic New York City. The Sentinel robots have gone well beyond their mandate and have become tyrants over North America. She meets up with Colonel Logan of the Canadian Resistance Army and they set in motion a desperate plan as the world is prepared to nuke North America to prevent the Sentinels from expanding their grasp. Society has crumbled and taken an almost medieval feel with horses pulling buses and people being divided into classes: M for Mutants, A for Anomalous who have the mutant gene potential, and H for clean humans. In this nightmarish future, the X-Men and other heroes, including the Avengers and Fantastic Four, have fallen before the might of the Sentinels. 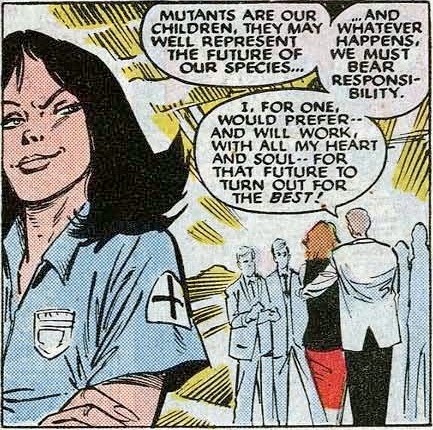 This future sequence introduces Rachel (which would later be retconned to Rachel Summers, the daughter of Scott and Jean Grey). Using her telepathic gifts, Rachel sends Kate's consciousness into her past self. To contrast that terrifying future vision, we witness the newest X-Man, Kitty Pryde, as she's put to the test in the Danger Room. To the team’s delight, she phases through all its deadly threats and passes. 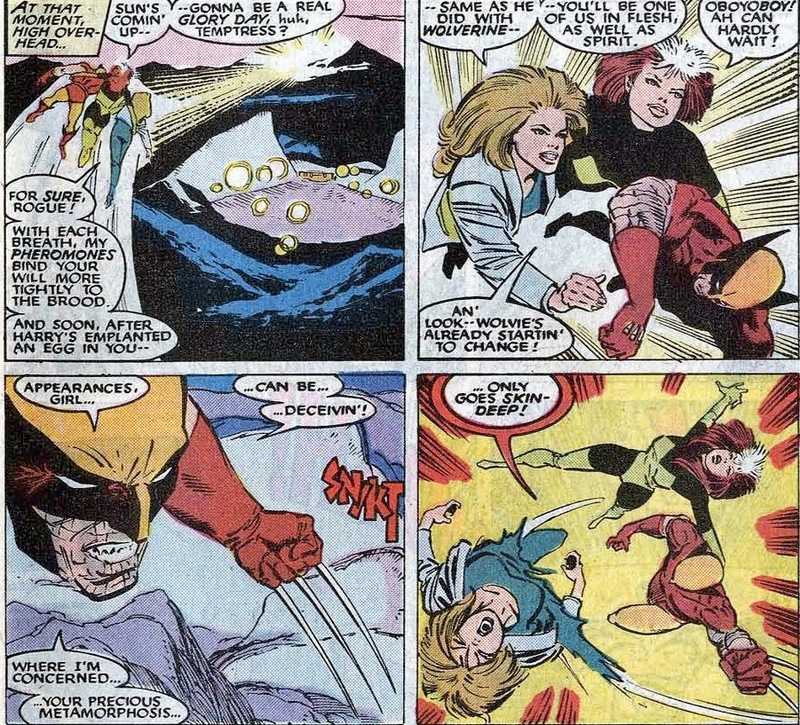 The consciousness transfer then happens and the X-Men react as the youngest of their team seems hurt. Kate's consciousness take over Kitty's body and after a brief reunion, she tells them of her future and that the assassination of presidential candidate Kelley will trigger the Mutant Control Act and make that nightmare future come true. Meanwhile, Mystique has assembled a new Brotherhood of Evil Mutants (Avalanche, Blob, Destiny, and Pyro) to kill Kelly. 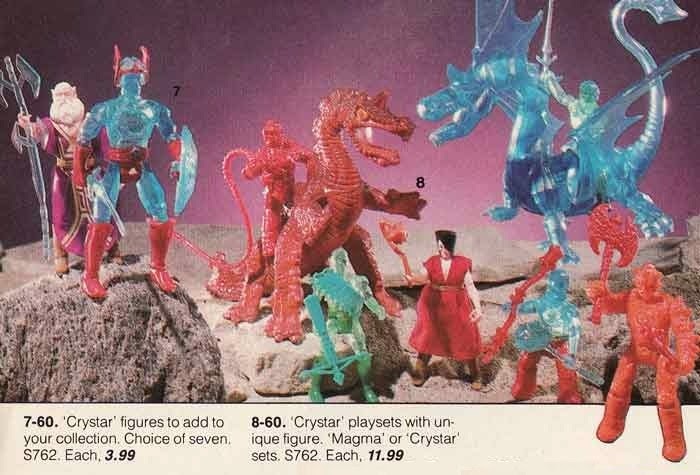 The X-Men then set out to stop Mystique. After an awkward start without Cyclops’ leadership (who was still on his leave after Jean’s death), the team comes together to defeat Mystique. But, just when you thought things were getting better, we flip back to the future where the Sentinels have caught up with our rag-tag group of mutants and despite a valiant effort, they are slain, adding more dramatic imperative to what’s occurring in the “present”. There’s a very touching set of panels depicting the surviving Rachel hidden in an alley with the unconscious Kate, and she feels her teammates die. The climax shifts to Kate Pryde who's the one who can stop Destiny from killing Senator Kelly. 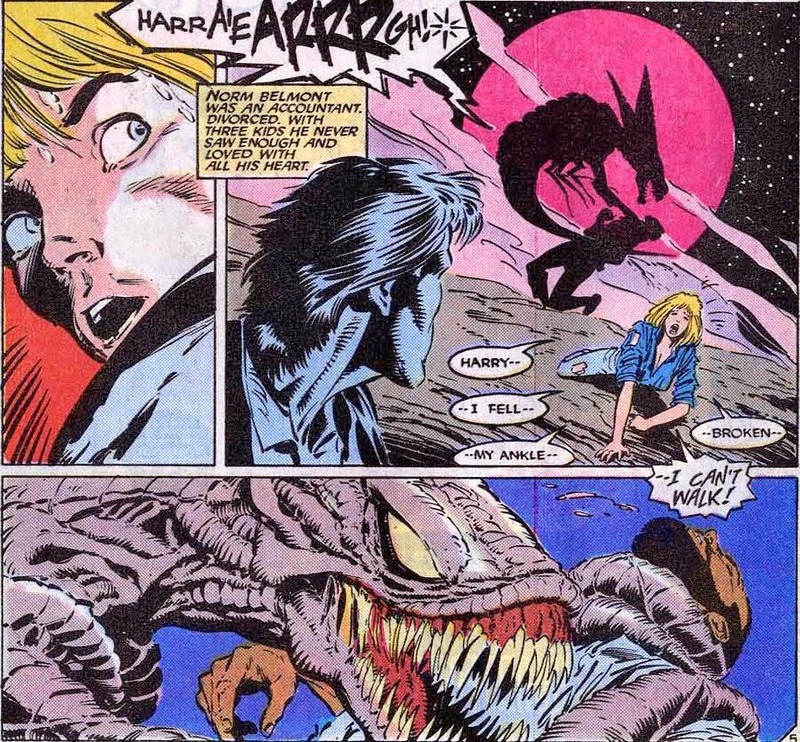 As she’s a temporal anomaly and beyond Destiny’ precognitive senses, she stops Destiny and rescues Kelly. 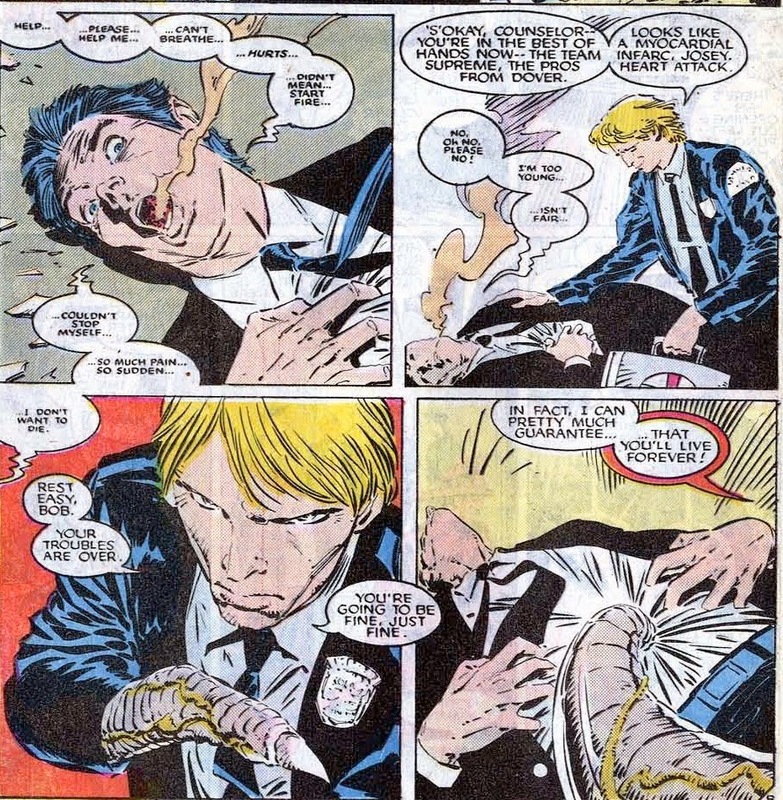 In the aftermath of this attack, Senator Kelly along with Sebastian Shaw (the mutant Black King of the Hellfire Club) work with Henry Gyrich to establish the anti-mutant program called Project Wideawake. This story’s really about friendships and loyalty and keeping Professor Xavier’s dream alive, it’s also about compassion. Kitty Pryde is the pivotal character in this story as she’s the newest X-Men, she’s a great character through which to approach this story, it’s also fun to see the contrast between Kitty and Kate and her sudden awareness of the future she will have with the X-Men. I completely forgot that the Angel was still part of that team at that point, not that he plays a significant part, but it was interesting to see him. Another interesting tidbit is the interaction between Nightcrawler and Mystique that suggested they have an intertwined past. 1988: Infectious X-Men Part VIII: The Power Of Chris(t) Compels You! In the eighth part of Infectious X-Men, the Brood's second confrontation with Marvel's merry mutants reaches the finale we all knew it would. But not before we head to Denver for an omelette and some of that ol' time religion. Pass the ammo, praise the lord...The Brood's come home to roost! When we last left the X-Men... they'd just discovered their old enemy the Brood had come back to Earth. After infecting one Harry Palmer, he served as recruiter for the alien body snatchers by infection a considerable number of mutants with Brood embryos. 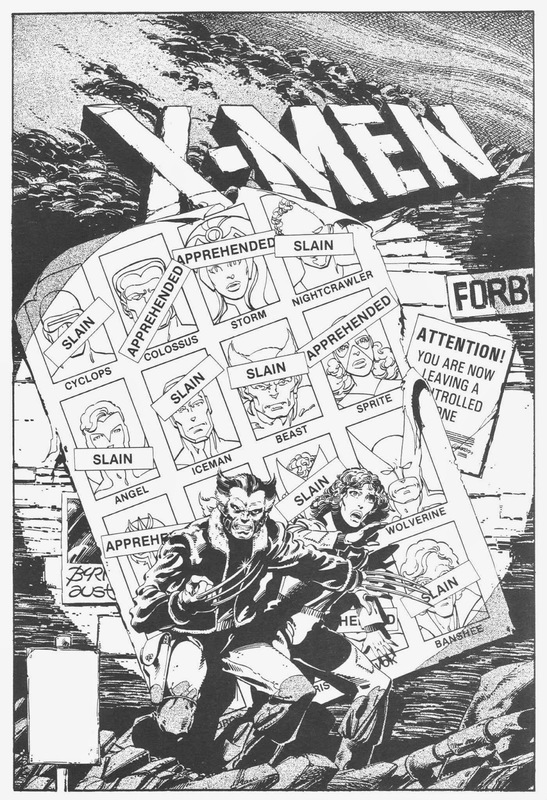 Well aware of the danger, the X-Men were determined to wipe them all out before they could become a global threat. Unfortunately, as soon as they confronted Harry Palmer he called in his, well, brood. They gave the team a rough time. Storm was forced to flee, albeit pursued by the Brood Dive-Bomber, while Wolverine, Psylocke and Rogue were inadvertently turned to the Brood's side. Heck, Wolverine even got implanted with yet another Brood embryo. Storm was able to defeat Dive-Bomber thanks to a timely assist from Havok (who killed the kamikaze creature with his plasma beam), while Colossus took on the Brood's powerhouse Brickbat...and won. Even though they still had strength in numbers, the brooding Harry Palmer ordered his forces to retreat. "Those heroes want blood... We'll give them their own!" But it was Harry Palmer who killed him, not you." 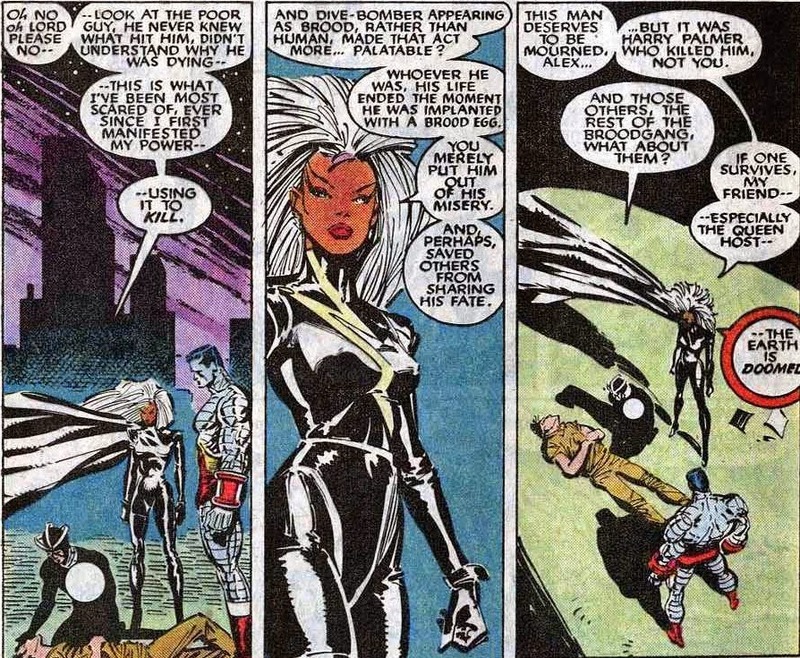 No matter the question if she's right or wrong, this stance is a far cry from the way Storm viewed the Brood during her first encounter with the alien race. 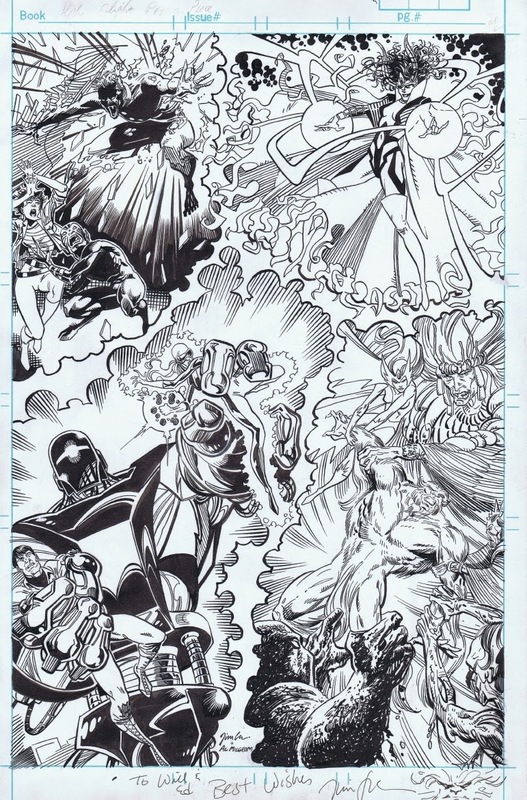 Once fiercely, even impractically, opposed against killing even a single lifeform, here we have Ororo Munroe extolling the necessary virtues of killing all the Brood in sight "lest Earth is doomed". It really shows the stakes involved and makes you drop on your knees and pray to God. 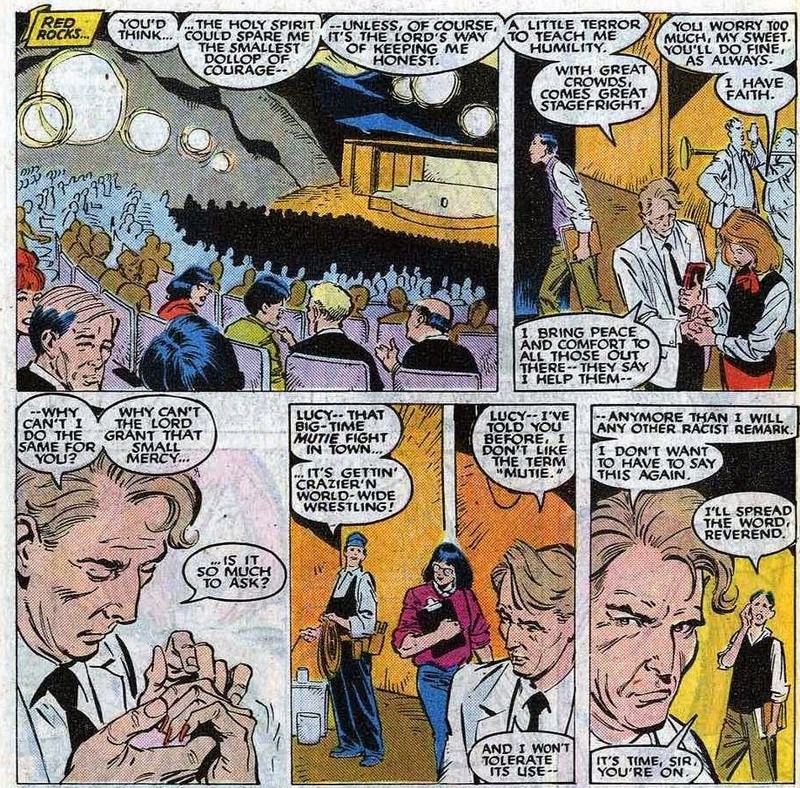 Speaking of the almighty, Uncanny X-Men I#234 opens at a national prayer meeting to be hosted in Denver, Colorado by the popular (television) minister William Conover. 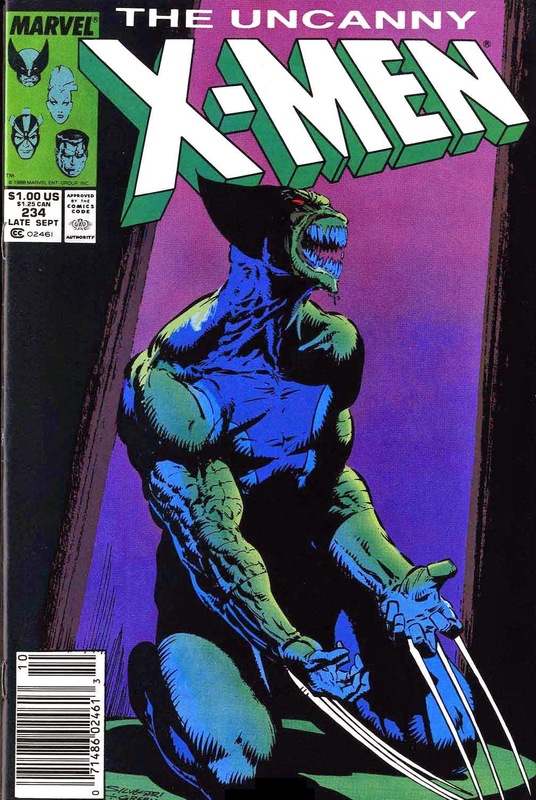 His presence had been subtly teased for at least two issues, with the X-Men and their foes encountering (or crashing in to) signs that tell of his presence. 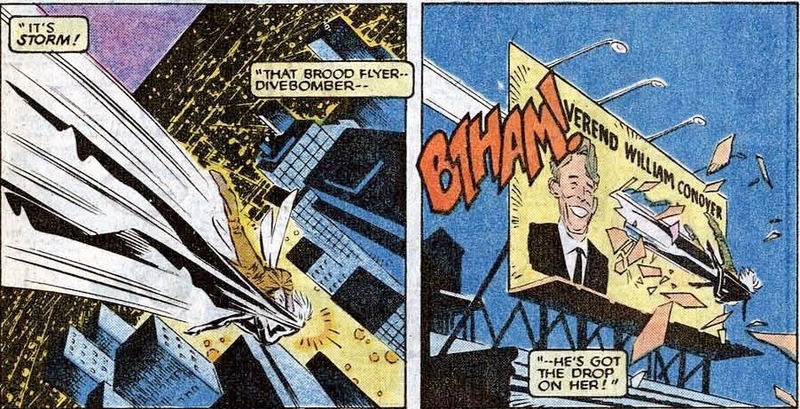 "That Brood flyer... Divebomber... He's got the drop on her." In the early set up of Uncanny X-Men I#234, we finally get to meet reverend William. Turns out, he's suffering from a slight crisis of faith because his beloved wife Hannah is suffering from cripping arthritis that seemingly no amount of prayer to the man upstairs is able to cure. "Why can't the Lord grant that smell mercy... is it so much to ask?" "If you'll let me, I've something that can fix that." But that's enough of that old-time religion for now. Let's check back on the X-Men who had been busy chasing the Brood. 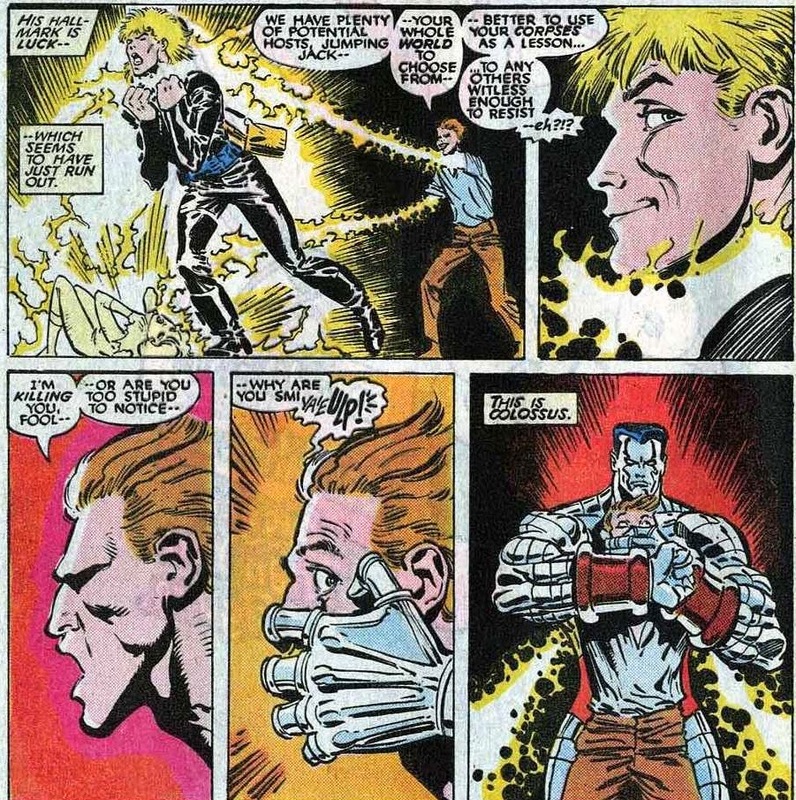 One of their confrontations led them to a local diner where Colossus, Dazzler, Longshot and the others faced the sleazoids and sparks really flew. In the end, the team was able to kill Tension, Blindside and several other Brood soldiers. This forced Harry Palmer to take Wolverine, Psylocke and Rogue some place else where he could either implant them with embryos or wait for the others to hatch. However, despite Temptress' best efforts, Logan wasn't having any of it, least of all that young queen growing inside him. "Appearances, girl... can be... deceivin'!" Incensed and out of her mind, Rogue tossed the rapidly changing Wolverine to the ground. 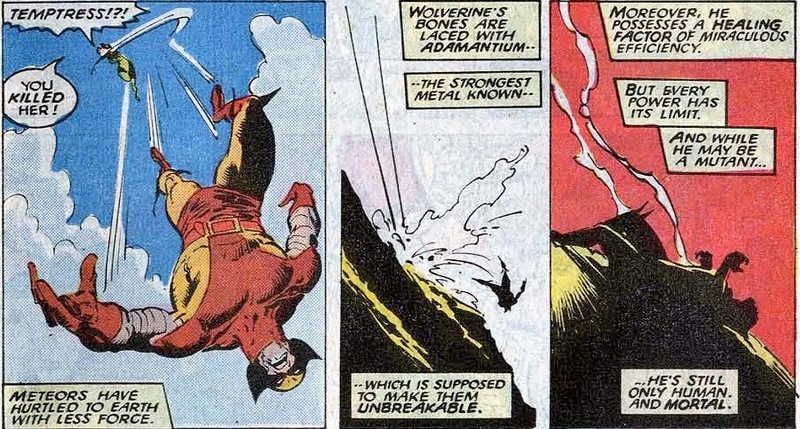 He landed hard, stretching his already taxed healing factor to the absolute limit. However, he still got up and staggered down the mountain, right into reverend Conover's prayer meeting. When his dishevelled, slightly smoking form caused unrest among the flock, the pious Conover called Wolverine to him. The reverend figured the poor, oddly dressed man was merely going through withdrawl and was in need of an uplifting spiritual. Guess how that almost turned out. "Hurl this creature... back to the satanic abyss from when it came!" 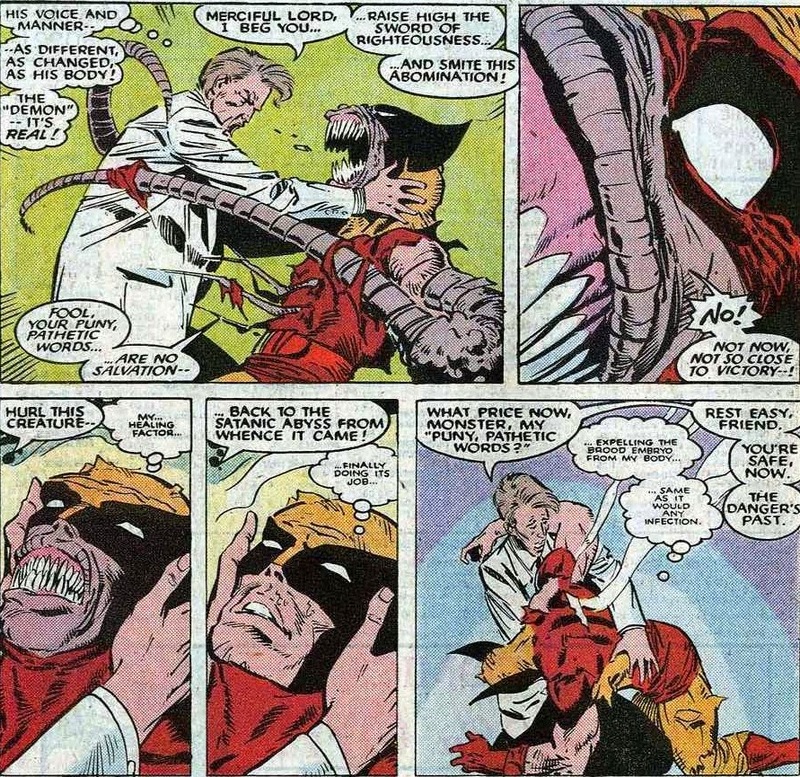 As gifted an orator the reverend might be, what finally did the trick was Wolverine's healing factor that saved him at the last possible instant by treating the Brood embryo as it would any other "ordinary" infection. "You called us demons, rev..."
Palmer managed to hold the X-Men off for a while, even taking the time to preach the gospel of the coming new world order until Wolverine showed up to do this. 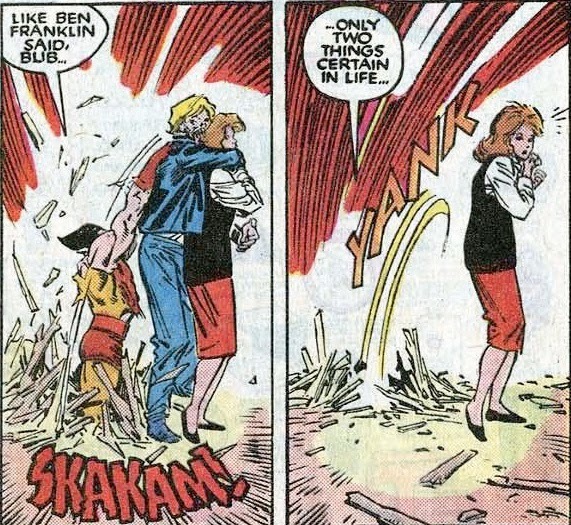 I always felt there was something inherently funny about the way Marc Silvestri set this scene. What happened next was no laughing matter, though. "You don't understand, bub. Harry Palmer died a long time ago." 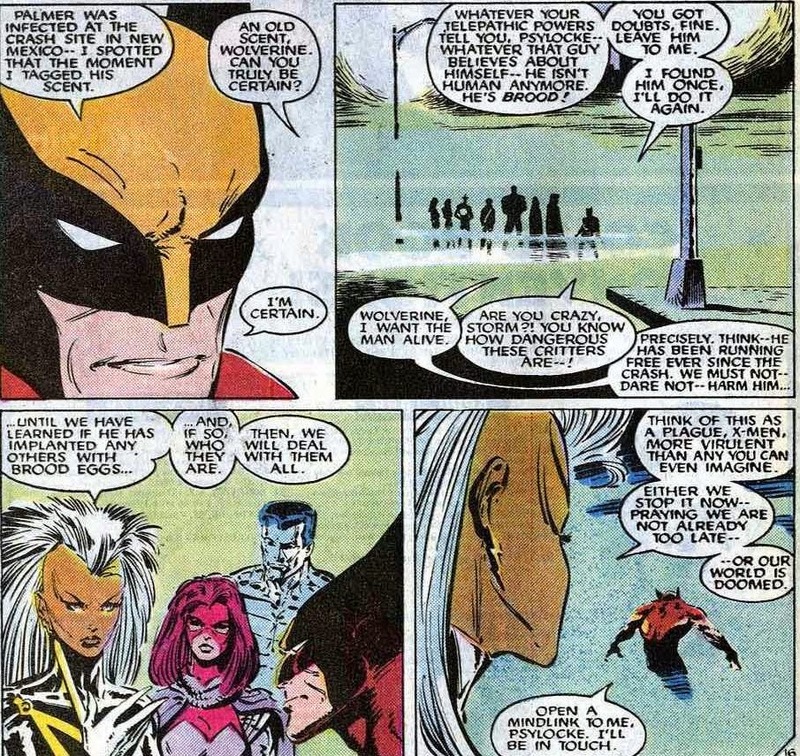 With a well placed *snikt*, Wolverine once again established his reputation as the killer on the team and seemingly ended the threat of the Brood. 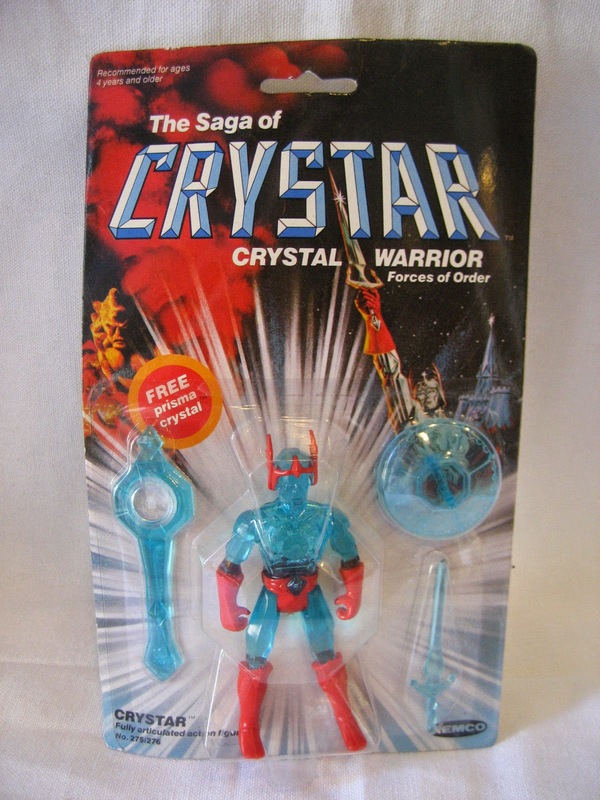 Given the aliens' established healing powers, one pop of the claws probably wouldn't be enough. But let's not get too gruesome and focus on the aftermath. Hannah Conover had some exciting news to share with her husband. "...Hands... Your hands!?! They can move again. Are they healed?!" Oy, what a miracle! God is indeed good. Or, wait a minute... Didn't Harry Palmer's partner offer to "help" poor ol' Hannah out? "For that future to turn out for the best!" Oh boy, if that nurse's smug, ominious glare doesn't spell "to be continued", I dunno what does. And, sure enough, years later this storyline was picked up on by John Ostrander when he wrote the 1996 mini-series X-Men/Brood: Day Of Wrath. In it, Hannah is revealed to be a Brood Queen, albeit a remarkably reasonable one. 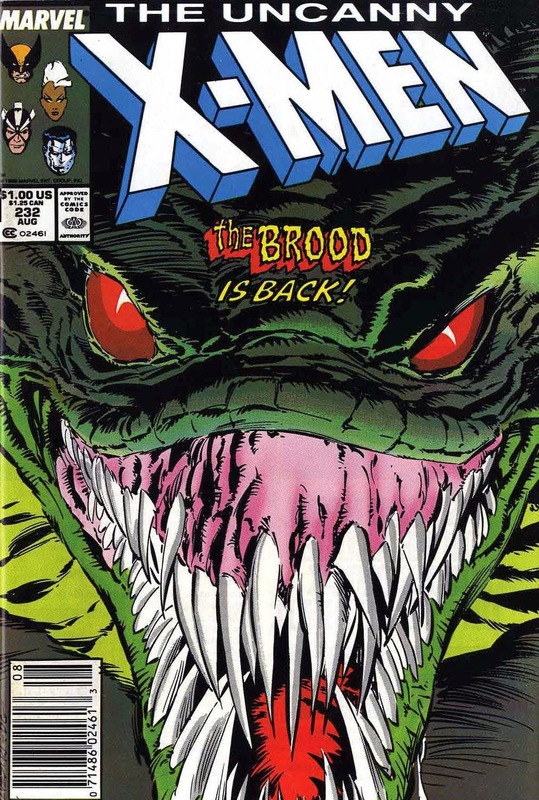 But that's all she wrote when it comes to the X-Men and the Brood in the 1980s. 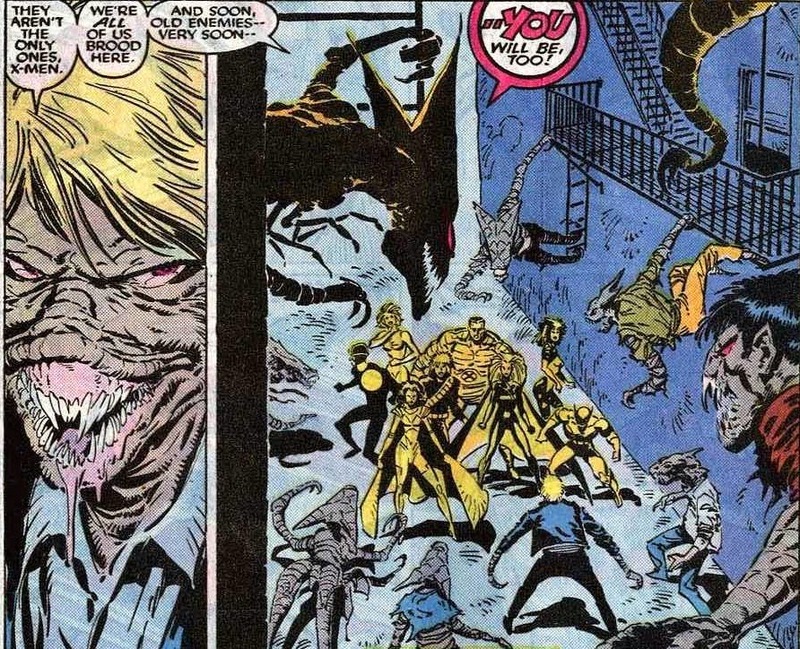 In the next and final part, we'll analyze the repercussions of the mutants' run ins with the sleazoids, as well as some glaring continuity errors in part IX of Infectious X-Men: Post Mortem Mayhem. 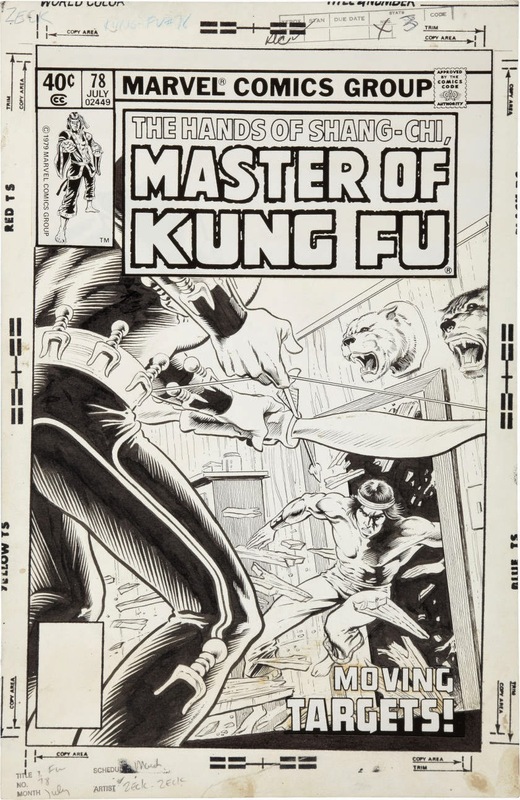 By John Buscema and Neal Adams. 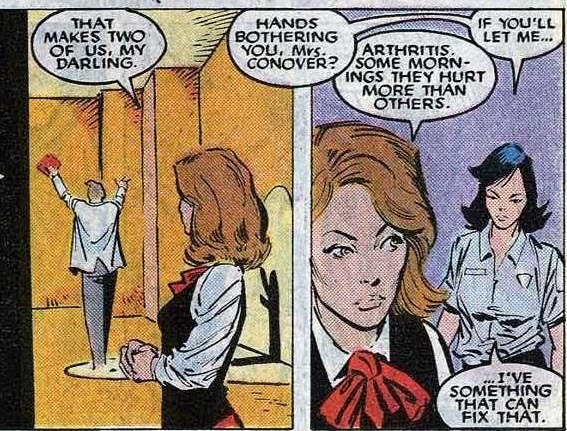 In the seventh part of Infectious X-Men, Chris Claremont has the Brood prove the old horror movie adage "sometimes they do come back" still holds true. It's been five years since we last saw a Sleazoid, but now the alien body snatchers are back... And they have a plan. "IS" back? 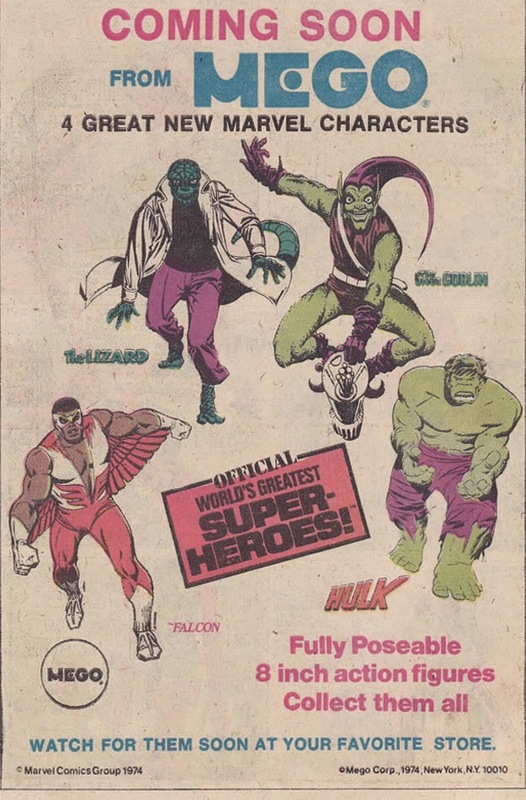 I always figured the Brood (by the very nature of their name) warranted a plural. But who am I to argue with creatures with giant teeth this size of Godzilla... 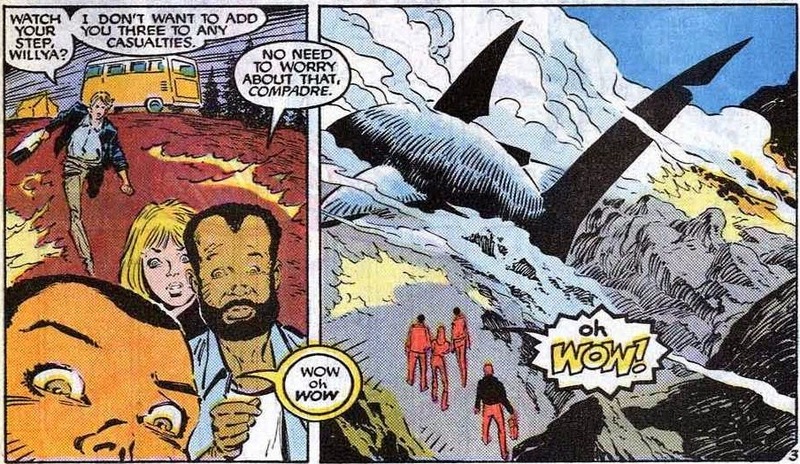 But that's neither here nor there, let's rejoice that after five long years of absence (and one tiny lil' 1986 movie called Aliens), Chris Claremont was letting the body snatching baddies out to play again. 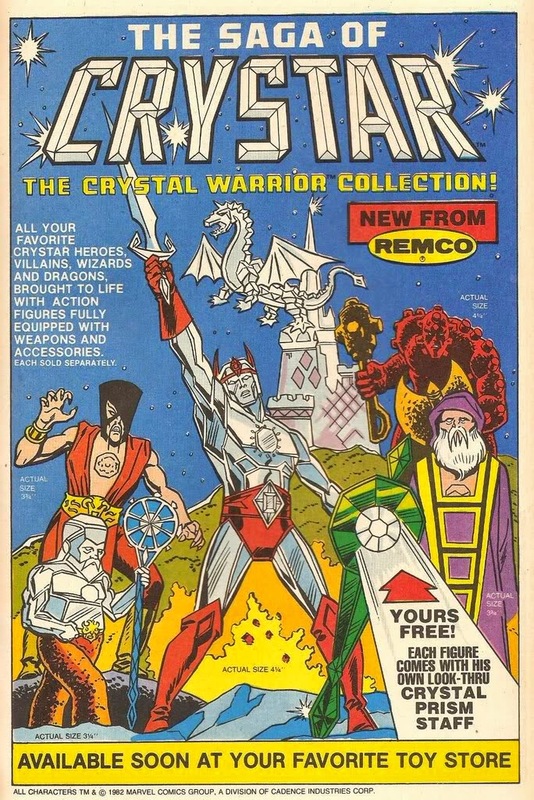 Though, in all fairness to Claremont, he'd been planning their comeback for well over a year. Back in June 1987's Uncanny X-Men I#218 we got this seemingly unrelated scene. Thanks to their mutant powers, Havok and Polaris survived this particular accident and the other driver seemed alright as well. 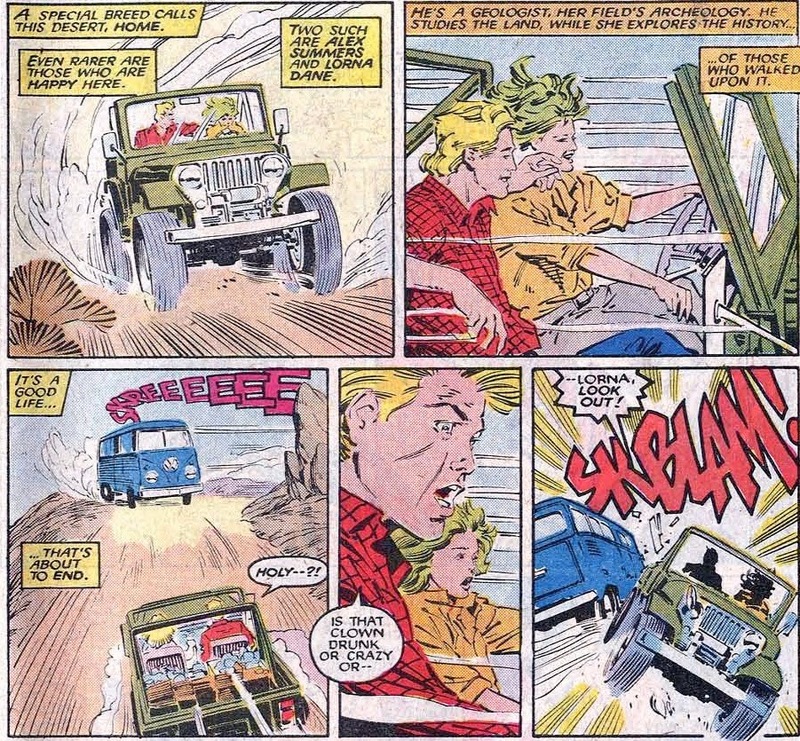 A full thirteen months later in Uncanny X-Men I#232, we find out why the maniac behind the wheel of that VW van was so upset. "Is this paradise, cruisers, or what?" Camping with cruisers, eh? That sounds like the sort of fun weekend you'd need some antibiotics for on Monday. If only because you're about to be eaten by a space shark. Yes, this particular outing was interrupted by one of the Brood's living vessels crashing near the campsite. Unable to keep well enough alone, the cruisers went to check out the site. "Wow oh wow. Oh WOW!" Harry Palmer, the blonde one in the back rushing in with a med kit, wants his friends to keep their distance until they can confirm it is indeed safe. Harry Palmer has resumed his job as a paramedic, along with his partner Josie. It seems like business as usual for ol' Harry, but when he's called in to help a lawyer who had a heart attack and suddenly started breathing fire, he shows his true colors. Yup, Harry did not escape the Brood... Somehow, he was infected with a royal egg and is now implanting others. Saving lives by implanting an alien embryo that supercharges a person's natural healing factor? Wonder if that's covered by Obamacare. All attempts at topical nonsensical humor aside, Palmer has been secretly recruiting. However, when he came home after a busy day of emergencies and umplanting, he found some unexpected guests waiting for him. Somehow the X-Men learned of the Brood's arrival on Earth and tracked Palmer to his appartment. 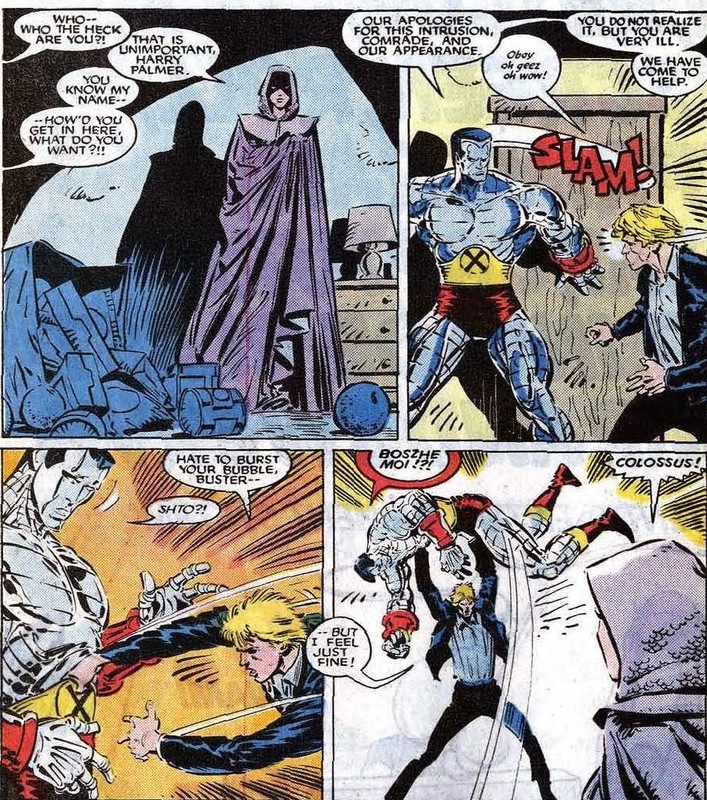 At first he seemed totally oblivious and innocent, until he suddenly charged Colossus and effortlessly threw him at Psylocke who only survived the collision thanks to her new body armor. 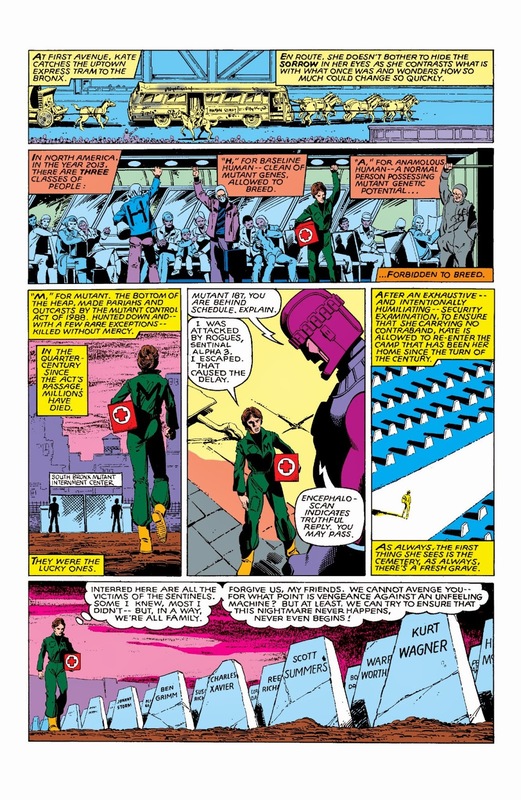 The X-Men briefly confront Palmer who eventually managed to evade them and disappeared into the night. "Either we stop it now... or our world is doomed"
Of the current X-Men line up, only Colossus, Storm and Wolverine had any experience with the Brood and knew the true extent of the danger they faced. 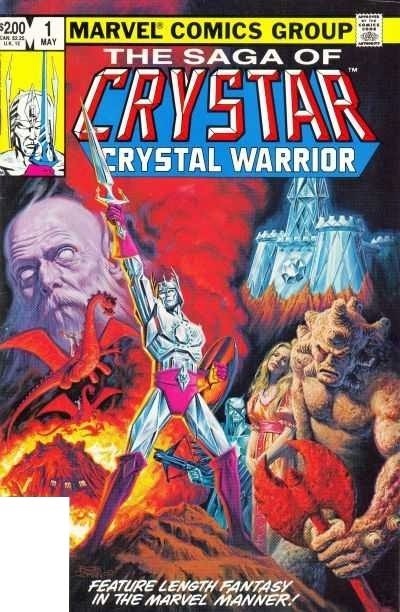 Psylocke's telepathic powers didn't pick up anything weird about Harry, so the team had to rely on Wolverine's senses. Again, it's not been revealed how the X-Men discovered their old enemies were back... A bit of an oversight on Claremont's part, though structuring the story this way adds a layer of suspense. Still, it could have been easily explained with a few lines of dialogue... During those days, the team operated out of the Reavers' old base in the Australian outback. The place came equipped with an advanced computer system that monitored television broadcasts from around the world. It stands to reason discovering the charred remains of a giant shark in the mountains would have made headlines. 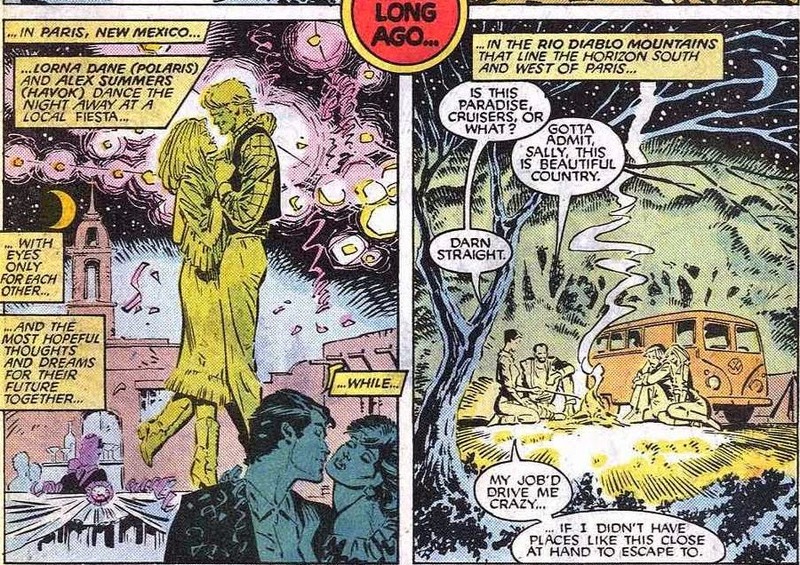 Recognizing the creature as a Brood vessel, the X-men would surely have gone down to New Mexico to check it out. Getting back to Palmer, still scared out of his wits he decided to get away from his assailants by bus. It seemed like he was still very much unaware he was possessed. "Safe... but for how long?" 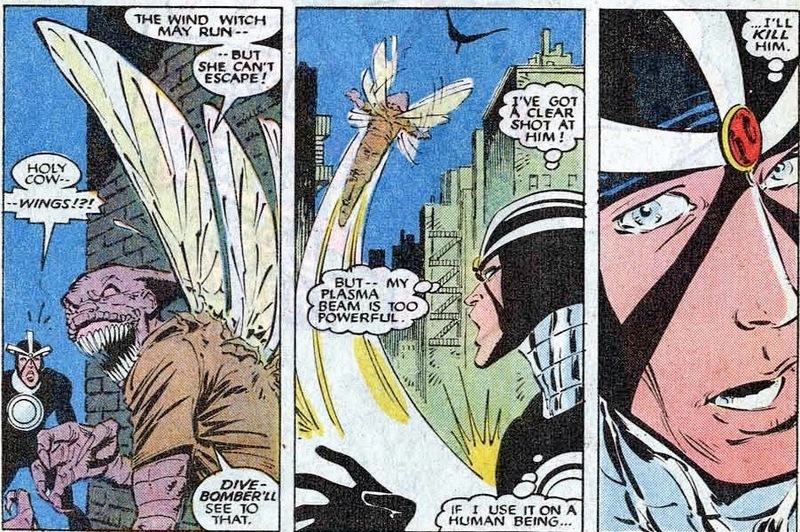 "This is a moment long overdue, little X-Girl"
Not to go all Freudian on you, sometimes a cigar is just a cigar after all, but there's something inherently sexual about Harry's Brood stinger about to stab and implant Rogue. 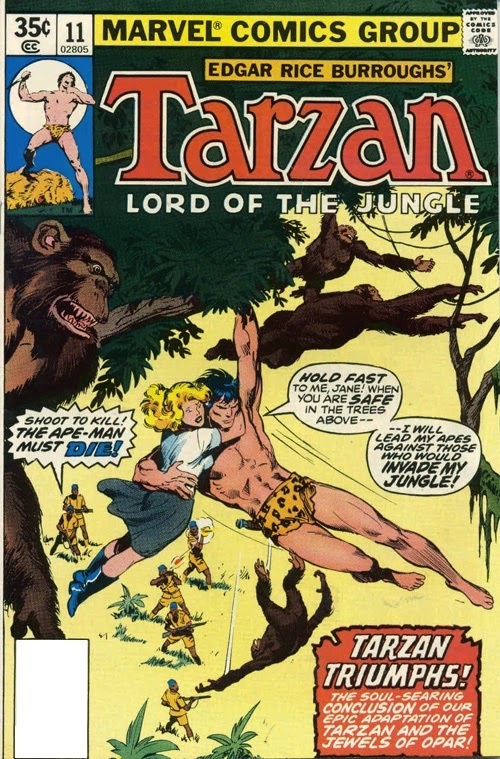 It's a little surprising that the Comics Code Authority did not view this as particularly suggestive. It also wouldn't be the last time Claremont wrote a situation in which Rogue was overpowered and about to be jabbed with an enemy's transformative poker. Case in point: Uncanny X-Men Annual 2000. "It's more interested in transforming Rogue into a Prime." "They're mutants, just like you!" In a move that mirrored the original Brood saga, the aliens only wanted hosts with superhuman powers their progeny would inherit. That meant Palmer had been rather selective when it came to the people he picked to be pricked. 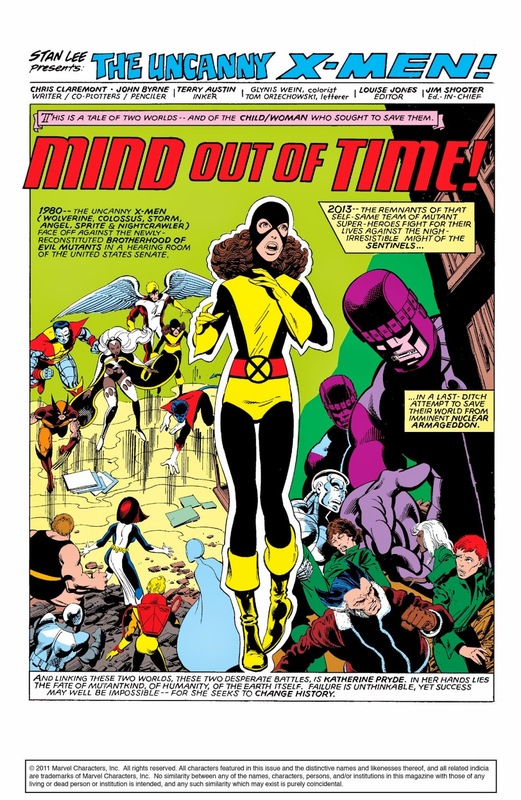 The X-Men found themselves under attack from a group of well trained, supremely powerful Brood/mutant hybrids who were tough as nails and were also more than a little at home when it came to Chris Claremont's favorite pet peeve: mind control. "Breathe deep, Storm... flood your system with my pheromones..."
"Can't help myself, ah'm absorbin' Temptress's power... an' psyche"
On a sidenote: I'm from a rural part of Holland and have been known to speak in somewhat of a dialect... But I've never "thought" the way I sounded. Still, Rogue took over Temptress's powers and in turn was controlled by the Brood mind mucker as well, who immediately used her pheromones on Psylocke and managed to lure her to the Brood's side as well. While the two female X-Men took on Wolverine, it turned out the newly free Storm wasn't in the clear yet either. Meet the Brood Divebomber... apparently a mutant who can fly. Now, I don't want to armchair quarterback Harry Palmer's recruits for the Brood's vanguard on Earth... 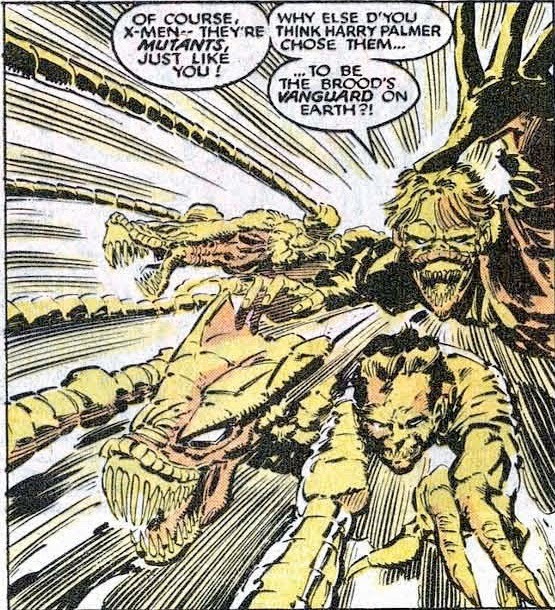 But if you're selecting mutants as hosts for aliens that has wings to begin with... You might want to pick someone with a more unique power. 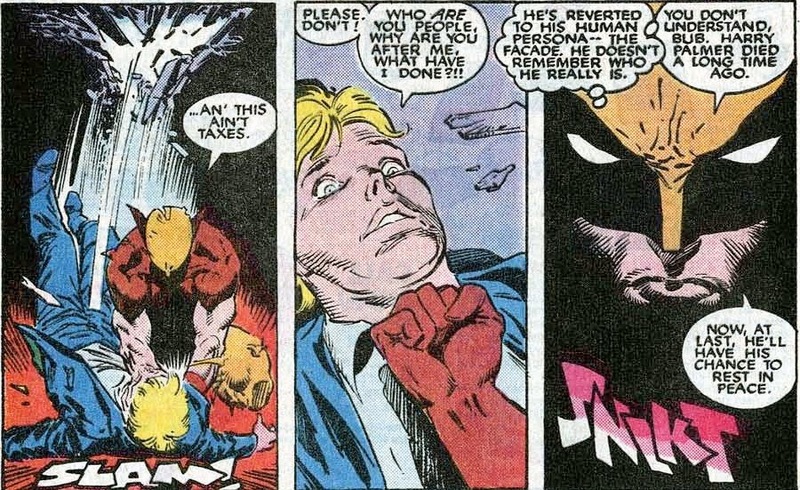 Also, first hand experience with them or not, Havok shouldn't have been thát surprised a Brood grew wings. 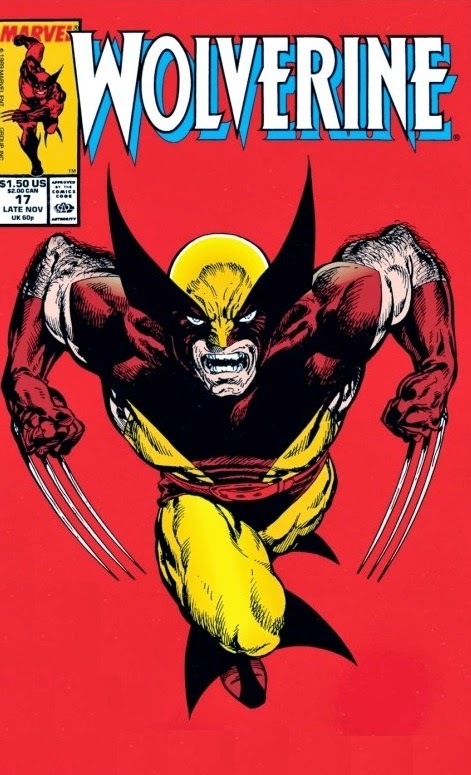 But, while Havok was contemplating using his immensly powerful plasma beams to stop Divebomber, Wolverine was busy fighting off his mind controlled teammates. 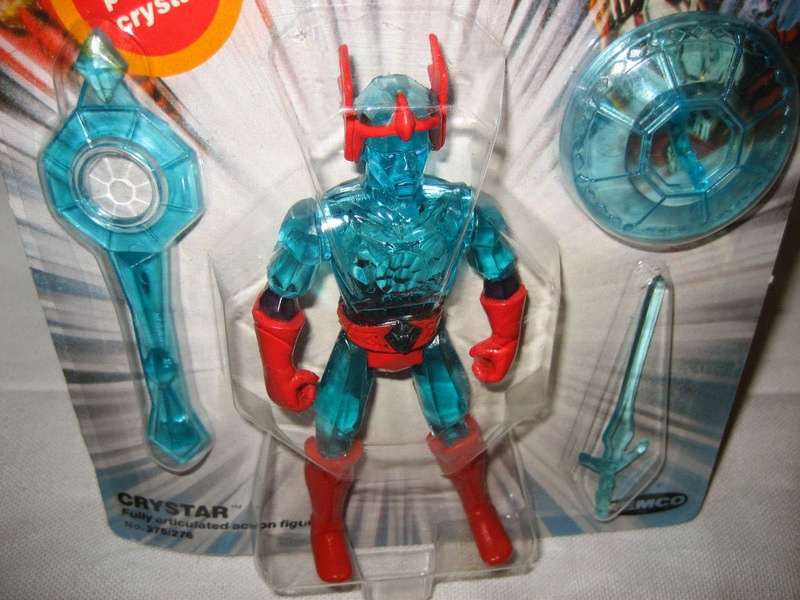 "And you know, X-Man... What happens next." Let's end on that truly creepy panel. When next we meet, the Brood's adventure on Earth concludes with a little religion in part VIII of Infectious X-Men: The Power Of Chris(t) Compels You!